Image caption The woman said she had been "let down by the benefit system"
A woman left incontinent by a violent sexual assault who was stripped of her disability benefit says she has been "let down" by the government. The woman, who lives in Kent and cannot be named, said the condition "controls my life on a daily basis". Her disability benefit was removed following a Personal Independence Payment (PIP) assessment. 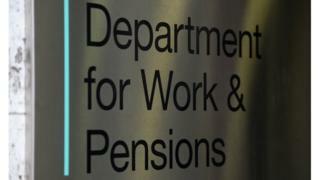 The Department for Work and Pensions (DWP) claimed it is "committed" to giving disabled people "full support". The woman, who was left doubly incontinent by a sexual assault 25 years ago, said: "I have to live my life being near a toilet. It makes me very socially isolated. It causes anxiety and certainly depression. "I feel very let down by the benefit system." She told BBC South East: "I have to go out with a change of clothes, spare pads, bin liners to cover the seat of the car. This is no way to live. "Until incontinence is recognised by PIP, hundreds and thousands of people are going to be in the same situation as me," she said. "Maybe we should all take the streets and defecate. It might be recognised then." Some 3.7 million PIP decisions have been made since it began to replace disability living allowance in 2013. Campaigners claim the assessments process is flawed, with about 72% of all PIP refusals overturned on appeal. Speaking at Prime Minister's Questions on Wednesday, Canterbury Labour MP Rosie Duffield urged Theresa May to intervene in the "failure to recognise the impact of this very serious condition". The DWP said: "Decisions are made following consideration of all the information provided by the claimant, including supporting evidence from their GP or medical specialist. "People who are unhappy with the decision about their PIP claim can appeal to an independent tribunal."